Custom replacement scales for 91mm / 3.6in Victorinox swiss army knives with an ORGANIC pattern. 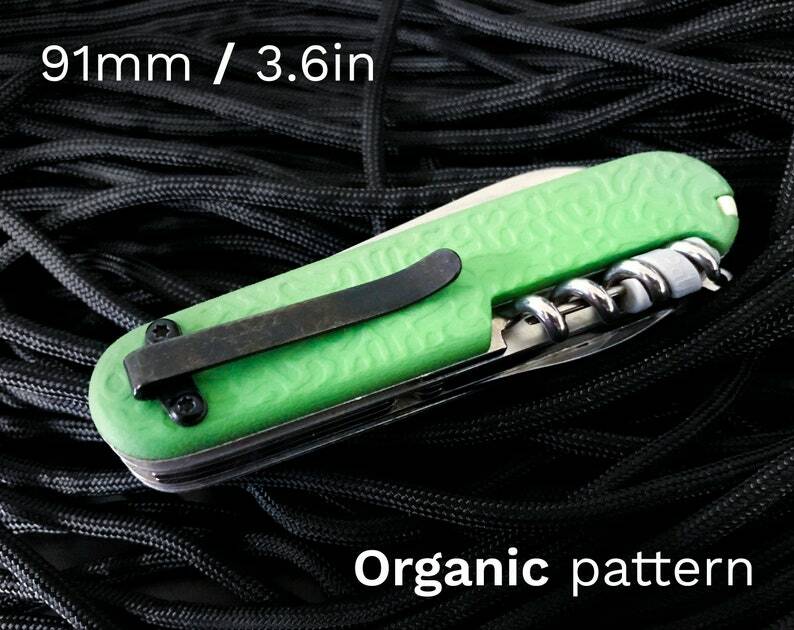 Features a removable deep-carry clip to keep your knife extra secure in your pocket. Scales are made of tough, laser-sintered nylon that feels great to hold and provides excellent grip. Available in a wide range of durable colors. The scales nicely snap on using a vice and fit well. I really like the texture. I wish there was an option for without clip or included smaller screws that could fill holes if removed clip, because I don’t use it. I know for many the clip is a draw, but I was drawn bt the textured plus (include pen) scales. This is a brillant design. The pocket clip is a great addition.